Made by Barbier, Georges in Paris, France, 1912-1914. These fashion plates are from a total collection of 186 Costumes Parisien fashion plates created for the Journal des Dames et des Modes by leading commercial artists of the day - George Barbier, Leon Bakst, Pierre Legrain, Etienne Drian, Victor Lheur, Gerda Wegener, J. van Brock, Armand Vallee and others. Fashion plate, Journal des dames et des modes, Costumes Parisiens No 35, engraved and screen printed 'pochoir' print, 'Manteau de Damas rose garni de Renard bleu Coiffure de Paradis noirs', des. Georges Barbier, Paris, 1912. Printed on Japan paper. Inscribed and labelled on the back. Fashion plate, Journal des dames et des modes, Costumes Parisiens No 46, engraved and screen printed 'pochoir' print, 'Robe du soir satin noir et tulle, bordee de brillants', des. Georges Barbier, Paris, 1913. Printed on Japan paper. Inscribed on the back. Fashion plate, Journal des dames et des modes, Costumes Parisiens No 80, engraved and screen printed 'pochoir' print, 'Robe de charmeuse noire avec corsage et panier formes d'un obi drape', des. Georges Barbier, Paris, 1913. Printed on Japan paper. Inscribed on the back. Fashion plate, Journal des dames et des modes, Costumes Parisiens No 104, engraved and screen printed 'pochoir' print, 'Robe de linon imprime', des. Georges Barbier, 1913. Inscribed on the back. Fashion plate, Journal des dames et des modes, Costumes Parisiens No 112, engraved and screen printed 'pochoir' print, Manteau de velours blanc brode de perles Robe de damas blanc Souliers roses', des. Georges Barbier, Paris, 1913. Inscribed on the back. 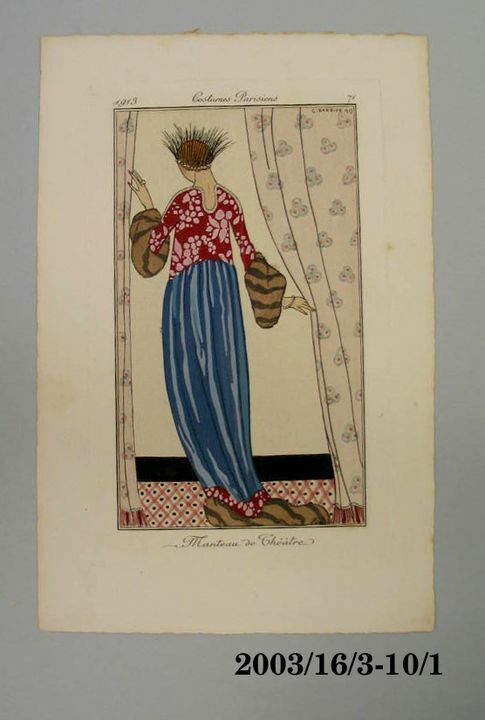 Fashion plate, Journal des dames et des modes, Costumes Parisiens No 116, engraved and screen printed 'pochoir' print, 'Mantelet de taffetas "a la vielle" garni d'une chenille verte. - Manchon brode de perles', des. Georges Barbier, Paris, 1913. Inscribed and labelled on the back. Fashion plate, Journal des dames et des modes, Costumes Parisiens No 156, engraved and screen printed 'pochoir' print, 'Tailleur de ratine verte et velours noir', des. Georges Barbier, Paris, 1914. Inscribed on the back. Studied at the Ecole des Beaux Arts, Paris. Barbier produced a large number of outstanding illustrations for the Journal des dames et des Modes, including plate nos 3, 8, 15, 21, 30, 35, 39, 42, 46, 51, 56, 61, 69, 71, 80, 84, 91, 96, 101, 104, 105, 112, 116, 150, 156, 164, 168, 170. In his early works (Plates 3 and 8), Barbier seemed somewhat restrained by a concern for 'pure' and precise design as shown in the high waisted Tailleur in Pale-Grey Silk, recalling Empire mode. Later works responded to more advanced concepts of fashion as in his 'Pink damask cloak trimmed with blue fox' (Plate 35) where he revealed he'd mastered his style, not so much by adhering to the earlier 'Persian' taste', but by his richer and more dazzling pallet influenced by the Ballet Russes and Lepape's album for Poiret. Barbier's work progressed to more compact layouts where the colours were confined by outlines, a sign of Art Deco. However, Barbier's style never became completely abstract. In his 'White crepe de Chine gown trimmed with white fox' (Plate 39), the characteristic decorative motifs of Art Deco are there but the linear rhythms still display the subtleties of Art Nouveau. The theme of the eighteenth century interested Barbier, as seen in his 'Longi Masquerade' plate. In later conceptions, like the 'Black 'Charmeuse' Dress' (Plate 80) and the 'Gala Evening Gown in Tulle and Silk (Plate 84), an explosion of colour and graceful, agitated line derived from eightenteenth-century art evolved and these characterise his work from around 1920. Ricci, F.M., Costumes Parisiens Journal des Dames et Des Modes Vol 1 & 2, Italy 1979] including introduction by Christine Nuzzi. One of a collection, offered as a taxation incentives donation to the Powerhouse Museum by Alistair Roberts, a Sydney-based theatre and costume designer and tailor, who assembled the collection with dedication and enthusiasm over several decades. Purchased by donor for private collection from various vendors in Sydney and internationally, including at flea markets on the left bank of the River Seine, Paris.